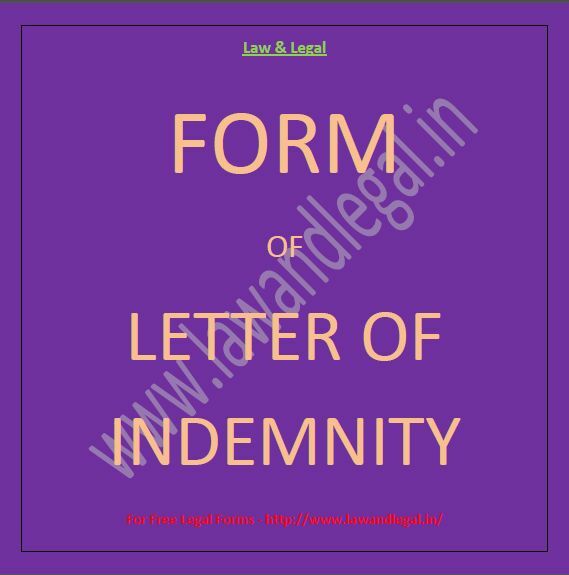 Here is a form of Letter of Indemnity - Indemnity Bond. A bank account holder died intestate leaving behind some amount in his bank account without nominating any person. 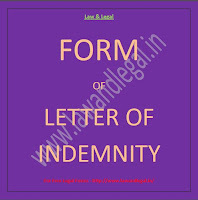 The sole legal heir of said account holder- who has not obtained either succession certificate or Letter of Administration from the appropriate court of law, is submitting this indemnity bond to the bank authority to withdraw the amount lying in the account of the deceased person. The Bond is also executed by a surety on his behalf. A PDF version of the form is also available for download from the link provided hereinbelow. IN CONSIDERATION of your paying or agreeing to pay me, __name of the claimant_, the sum of _ the amount_ standing at the credit of Savings Bank Account No. _account no._ with your bank in the name of __name of the account holder_, since deceased, without production of Letters of Administration or a Succession Certificate to his/her estate or a Certificate from the Controller of Estate Duty to the effect that estate duty has been paid or will be paid or none is due, I, __name of the claimant_, and I, __name of the surety_, do hereby for ourselves and our heir, legal representatives, executors and administrators, jointly and severally UNDERTAKE AND AGREE to indemnify you and your successors and assign against all claims, demands, proceedings, losses, damages, charges and expenses which may be raised against or incurred by you by reasons or in consequence of your having agreed to pay / or paying me the said sum as aforesaid. Signed, Sealed and Delivered by the above named Claimant and Surety on this __the day__ day of __the month__, 2012 at __place__. Immovable Property viz. land / building, flat etc. give details acquisitions, present value etc. I confirm that all the statements made by me in this application are true and correct and have been made by me.